Short Ribs are a hearty and very satisfying dish that takes little skill to achieve an amazingly tender and flavorful dinner. This short rib kit is not only exciting but easy to prepare. All the spices and dehydrated vegetables come in the Dinner Kit and, by the way, all of the ingredients are natural. Each dinner kit is enough to feed 9 people! This sensational dish of fall-off-the-bone tender short ribs melts in your mouth. A delicious easy to prepare meal with old-fashioned homemade flavor. 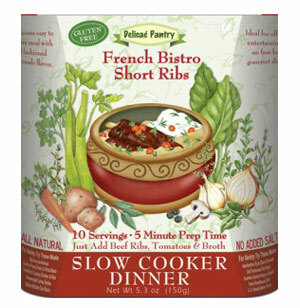 Ideal for effortless entertaining and no fuss hearty gourmet dinners!